Researchers from North Carolina State University have designed a sensor that can measure strain in structural materials and is capable of healing itself – an important advance for collecting data to help us make informed decisions about structural safety in the wake of earthquakes, explosions or other unexpected events. Engineers use sensors to measure the strain, or forces, exerted on materials used to build everything from airplanes to civil infrastructure. For example, these sensors can tell us how an airplane wing is performing in flight, and give maintenance authorities advance notice when the wing may be near failure. In other words, it gives you a chance to address an issue before it becomes a problem. Historically, one flaw in such sensors is that they can break under stress. That means the sensor can no longer provide information to users, but it doesn’t necessarily mean that the material they were monitoring has been irreparably harmed. And, as in the airplane example, the sensors may be inaccessible – making them difficult or impossible to replace. “To address this problem, we’ve developed a sensor that automatically repairs itself, in the event that it is broken,” says Dr. Kara Peters, an associate professor of mechanical and aerospace engineering at NC State and co-author of a paper describing the research. The sensor can stretch and compress along with the material it monitors. An infrared (IR) light wave runs through the sensor and detects these changes in length, which tells us how much strain the material is undergoing. The sensor contains two glass optical fibers that run through a reservoir filled with ultraviolet(UV)-curable resin. The ends of the glass fibers are aligned with each other, but separated by a small gap. Focused beams of IR and UV light run through one of the fibers. When the tightly focused UV beam hits the resin, the resin hardens, creating a thin polymer filament that connects the glass fibers – creating a closed circuit for the IR light. The rest of the resin in the reservoir remains in liquid form, surrounding the filament. The remaining liquid resin is important. 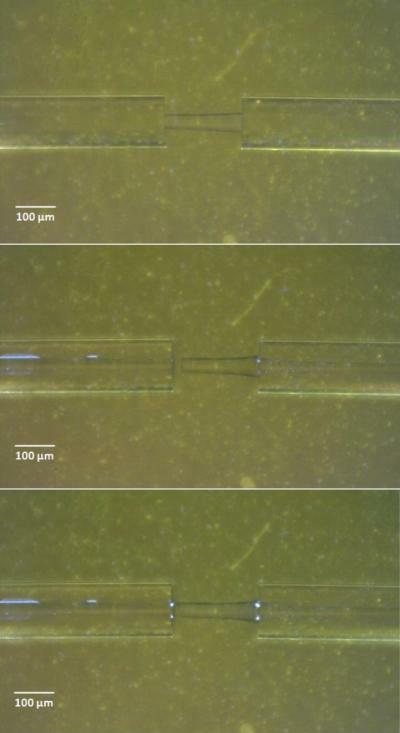 If the polymer filament breaks under stress, more liquid resin rushes into the gap, comes into contact with the UV beam and hardens – repairing the sensor automatically.